After laying hands on “the Tesseract” (a cube shaped source of energy capable of opening portals between worlds), Asgardian demi-God Loki (Tom Hiddleston) becomes hell bent on conquering Earth once and for all. Realising they don’t have a human army resilient enough to check his wrath, S.H.I.E.L.D. director Nick Fury (Samuel L. Jackson) calls upon six individuals with superhuman abilities – Iron Man (Robert Downey Jr.), Captain America (Chris Evans), Thor (Chris Hemsworth), Hulk (Mark Ruffalo), Black Widow (Scarlett Johansson) and Hawkeye (Jeremy Renner) – in a plan codenamed the “Avengers Initiative”, to band together and put an end to Loki’s treacherous threat. It’s easy to see that Whedon was the perfect choice to take on The Avengers (known in the UK as Avengers Assemble), with the experienced storyteller slipping into his dual role as writer and director with an enviable ease considering the Herculean task at hand. He’s clearly been doing his research all his life. His sophisticated approach is deeply rooted in years’ worth of enthusiasm and adoration not only toward the collective, but also to each and every one of the individuals, forever remaining respectful of the unique characteristics they harbour and the histories already established in the previous films. His narrative is uncomplicated, but its through the unabashed campness, back-and-forth dialogue and the contrast between each of their combating personalities that The Avengers truly comes alive. Each of the six individuals’ inclusion feels entirely organic to the separate worlds from which they are derived, while also working in the world created for them as The Avengers by Whedon. Their reluctance not only for the task at hand but also towards one another is relatable and feels entirely natural, especially considering the unexpected velocity with which they’re called upon, one by one. Whedon is very careful to present them first as separate beings, allowing them time and space to find a viable way to work together and put aside their – occasionally vast – pride and personal issues. There may be some minor flaws, mostly to do with pacing and one or two unnecessary devices employed only to create further tension, but, when the conclusion comes, these feel insignificant. Indeed these are almost necessary in the way they play into the various threads left hanging – obviously as a way of allowing further examination if (or more likely, when) Marvel decides that a sequel is warranted. Whedon isn’t alone, with the entire ensemble cast as committed to the cause as he, resulting in a far more enjoyable and rewarding experience than if, say, there had been a weak link present to disturb the equilibrium. While the narrative allows each superhero their own time to shine, the double threat of S.H.I.E.L.D. Agents Coulson and Hill (Clark Gregg and Cobie Smulders), and a buoyant Pepper Potts (Gwyneth Paltrow) hold their own in, to an extent, lesser roles. While Loki’s pawns prove to be more of an annoyance than a needed extra element, the main villain himself excels. Where the first act, while hardly dawdling, acts as a foundation for Loki’s threat and the assembling of the team, things soon develop into a non-stop thrill ride set in and around the island of Manhattan. Whedon’s character-based focus never wanes, however, even when he depicts a battle of good versus evil like no other with a subtle and well-employed use of shaky cam and incredible effects. He never lets up with the wit, tension and mystery, wiping out any smidgeon of doubt that Whedon, whose feature-length directorial skill is unrefined – might be too much of a novice. 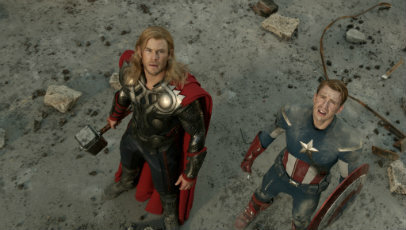 Years in the making, The Avengers comes to the screen with monumental expectations. It’s a relief, then, that Marvel entrusted the responsibility with someone as respectful of both comic book fans and cinephiles as Whedon. He’s a filmmaker who, above all, is able to capture the heart and soul of superheroes and make them relatable and honest, despite the supernatural exploits and grand spectacle that threaten to distance them from a society that feels entirely representative of our own. In simple terms, it’s a Hulk smash-polooza.